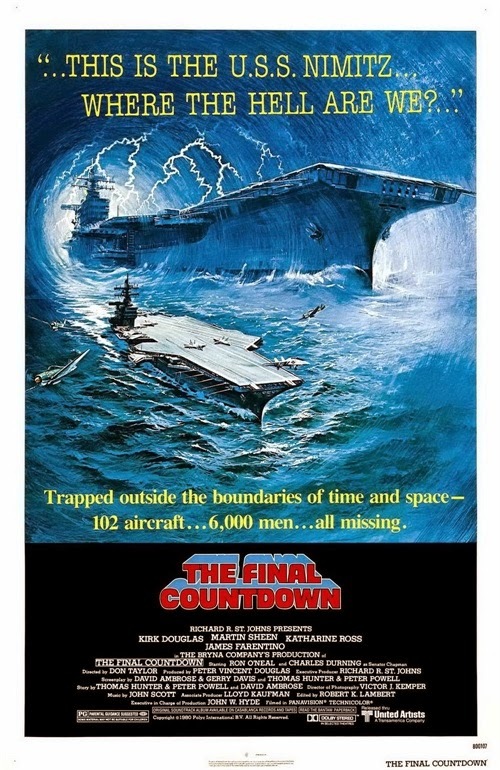 The Final Countdown was completely off my radar when it cruised into theaters back in 1980. That may have had something to do with a little film called The Empire Strikes Back, which all the kids were scrambling to see. 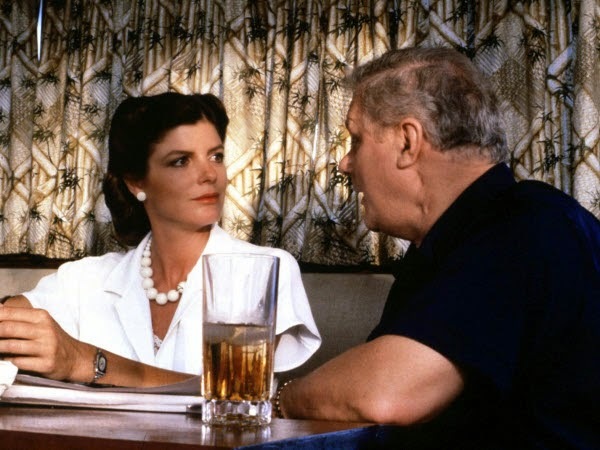 It also may have been due to Countdown's stars—Kirk Douglas, Martin Sheen, and Katharine Ross—not being the sort to lure my younger self into theaters. Add in the lack of wham!-pow! special effects or the interstellar scenery Hollywood was already making all the kiddies crave, and my lack of awareness is even more understandable. But the fact that I didn't discover this smart, ambitious science fiction film until now I lay squarely at the feet of that awful 1986 song of the same name (whose shrill, hair-band chorus makes me shudder in embarrassment for the entire decade). Because as it turns out, The Final Countdown is an admirable attempt at the kind of time-travel scenario found in an early Twilight Zone or Star Trek episode (such as "The Last Flight" or "Tomorrow Is Yesterday," for those in the know). The movie's central premise is simple: What if a modern-day aircraft carrier slipped through time and found itself in the waters near Pearl Harbor, on December 6, 1941—the day before the Japanese attack? It's the kind of intriguing premise that, used today, might serve only as pretext for wowing us with a deluge of nonsensical battles, explosions, and computer-generated effects. But Hollywood's idea of mass entertainment had yet to acquire ADD, and working with only a $12m budget (low even then), journeyman director Don Taylor and his team of writers chose to handle their material like adults. Instead of relying on special effects (which are, to be frank, pretty shaky here), they spend much of the film's running time tracking the quite believable responses of the ship's crew as they slowly grasp their situation. The production also takes advantage of its chief ace in the hole—the full cooperation of the U.S. Navy—to show off the real-life workings of the U.S.S. Nimitz. This provides a fascinating amount of (presumably authentic) detail for aviation buffs, including some outstanding aerial footage unmarred by digital tinkering, a highlight of which is a nifty encounter between two F-14s and a couple of Japanese Zeros. Such attention to process, equipment, and personnel helps ground the story in a reality that makes the ensuing fantasy all the more believable, and keeps the film from tipping over into simple Navy propaganda. By today's standards the buildup to the crew's realization might drag a little—we've seen so many time travel tales since 1980, it's tough not to feel a little impatient (a similar concept, played in reverse, was explored four years later in The Philadelphia Experiment). But the realism here is refreshing, as is the seriousness behind the questions being raised. After all, the implications of such a journey would be vast: With the chance to save so many lives at Pearl Harbor and change the course of history, should the Nimitz, with its superior firepower, take action against the Japanese? As captain and crew debate their options, the Japanese continue their relentless march toward infamy. 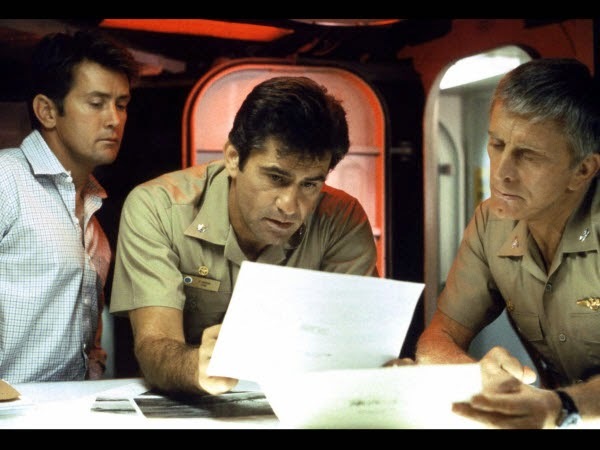 Douglas and Sheen are solid under Taylor's no-nonsense direction, while James Farentino and Charles Durning, as a senator with a pivotal role in history, manage to bring a bit of fire to their parts. It's also nice to see Katharine Ross, an actress of great beauty if limited range, in something other than The Graduate or The Stepford Wives. For her and most of the cast you get the feeling this was done mostly for the paycheck—sci-fi flicks still not being entirely respectable—yet their professionalism is served well by the above-average script and genuine attempts at plausibility. What might be most remarkable about The Final Countdown is that it was co-produced by none other than Lloyd Kaufman—future creator of The Toxic Avenger and Class of Nuke 'Em High—lending the film a whiff of unreality that almost makes you believe time travel is possible. If it were, I'd likely go back to 1980 and smack my younger self in the head for missing this one. And then I'd find a way to prevent the members of that Swedish rock group from recording such an awful, awful song. NOTE: This title expired on 8/1/14.